Last week we touched on the wonderful Teton Wilderness which lies on the flanks of Turpin Meadow Ranch but this week let’s take a look at the legislation that placed this gem into the highest form of protection in the United States (and possibly the world). Just over 50 years ago a few forward thinking conservationists, including the wonderful and local Murie family, decided that beyond the national park system there needed to be a form of protection that put nature and landscape first. At the time there were plenty of wild, untracked and unspoiled acres within the national park register but developments had been made to accommodate human existence; roads to view the most important features, lodges to accommodate guests, restaurants to feed those hungry motorists. We can be assured that under the park system Old Faithful will never be coin operated but the Muries and the Zahnisers felt that certain swaths of land should be left completely untouched by human influence. Natural processes, as had occurred for millions of years, would be the dominating force on the land and humans could only interact with nature in a primitive manner, meaning no mechanized travel. The original Wilderness Act of 1964 placed 9.1 million acres of land in wilderness protection. This number has grown throughout the years and with the passage of the 1984 Wilderness Act another 1.1 million acres here in Wyoming was protected for Wyomingites and all citizens of the United States. 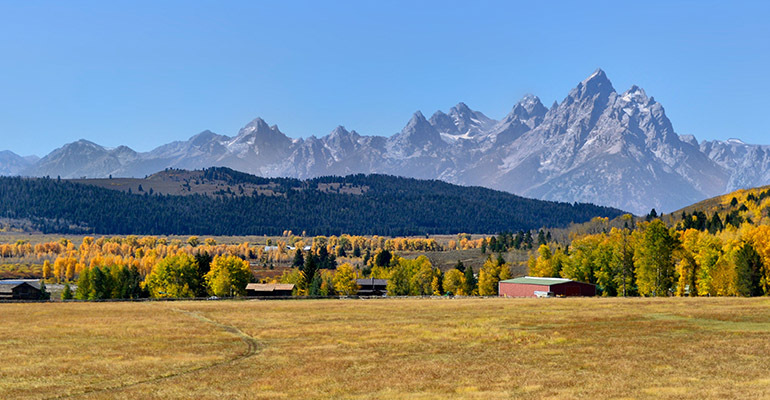 The Teton Wilderness provides a wilderness experience for our guests at Turpin Meadows Ranch. The pristine peaks and waters of this magnificent country are a direct result of the original 1984 Act.